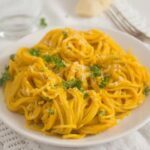 The best creamy pumpkin pasta sauce with parmesan and parsley, easy to make and totally delicious. This is a repost from September 2015. This is my first pumpkin recipe this season but if you have been searching for other pumpkin recipes here, you might have noticed that I am slightly obsessed with pumpkin. For me almost every recipe I have ever cooked with pumpkin was either “amazing” or “the best ever” or “unbelievable” and so on. 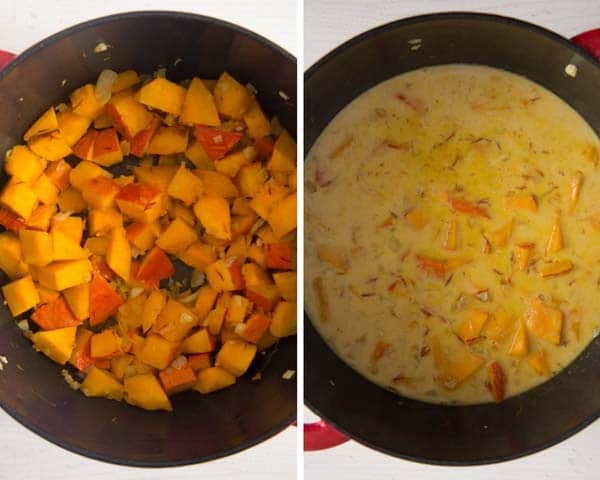 I have to say I only cook two sorts of pumpkin: Hokkaido and butternut squash. I have tried 2 or 3 other kinds over the years, but none of them was ever so tasty as the above mentioned. So I let it be and only buy these two, they are the easiest ones to find anyway. A spaghetti squash might be on the list from time to time as well, but really not too often. I loved every bit of it, it was easy to cook, the children liked it, although they are normally not so keen on pumpkin as I am. I will definitely cook this again and again and I strongly recommend you try it as well. We had the pumpkin pasta sauce for the first time with homemade giant gnocchi. However, ever since I have cooked this pumpkin sauce recipe mostly for spaghetti or another kind of pasta shapes. You can make your own gnocchi if you wish, buy ready-made ones or just cook some pasta. 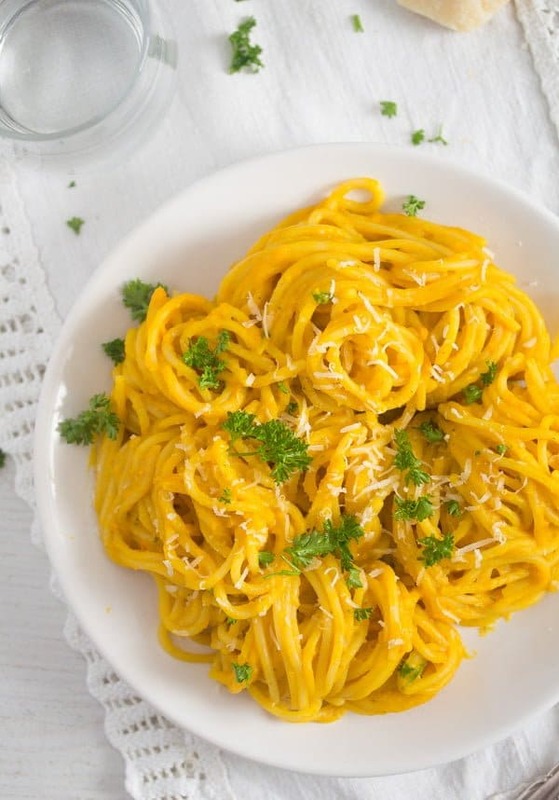 The Hokkaido or butternut squash pasta sauce will be delicious no matter what you eat it with. I tweaked the original recipe quite a lot, it was full of cheese and crème double and butter. Not that I don’t like that, but I really don’t need the extra calories. The way I made was perfect for me, I cannot imagine this tasting any better. As mentioned above I either use Hokkaido pumpkin or butternut squash to make this pumpkin sauce recipe or any other pumpkin recipe as a matter of fact. 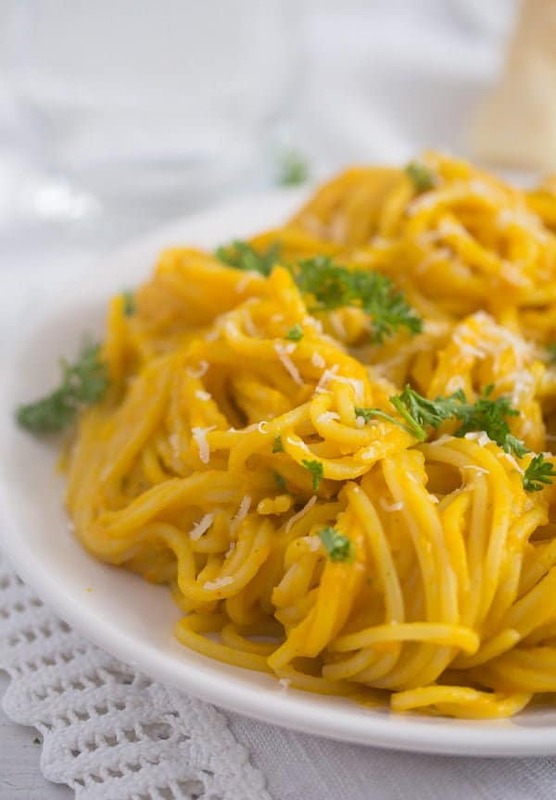 You will need a rather small Hokkaido or butternut squash to make this creamy pumpkin pasta sauce, or rather just about the half of a regular sized pumpkin or squash. I can rarely find such a small pumpkin or squash, so I buy one and plan to make two pumpkin recipes in a 2 or 3 days. That is never a problem, pumpkin is so delicious and versatile, I never have problems of finding uses for it. 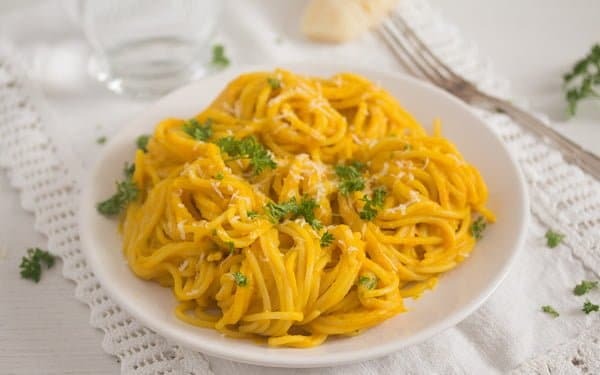 Well, it is mostly a main dish like this pumpkin pasta sauce and a soup, a creamy pumpkin soup is a regular in autumn and winter. 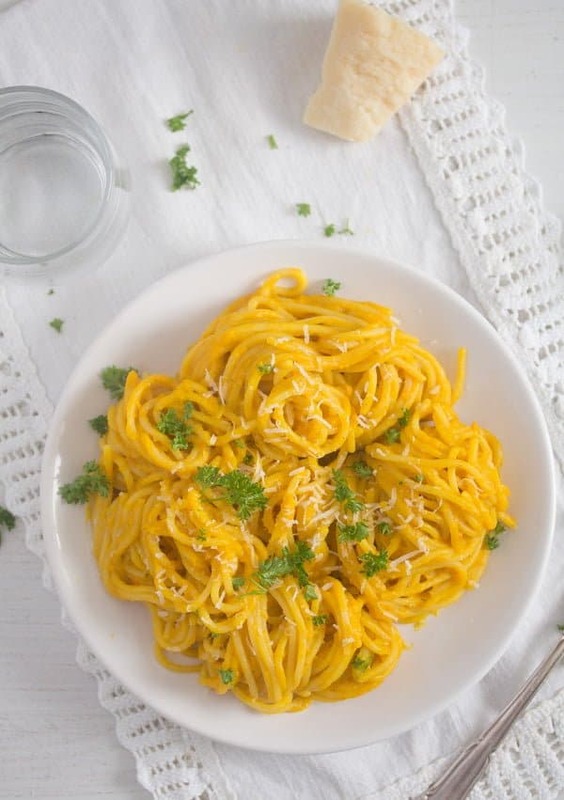 The first times I have cooked this pumpkin pasta sauce recipe I used saffron threads. I liked that, but saffron is expensive and I have to admit that saffron is the one spice I don’t always have in the house. 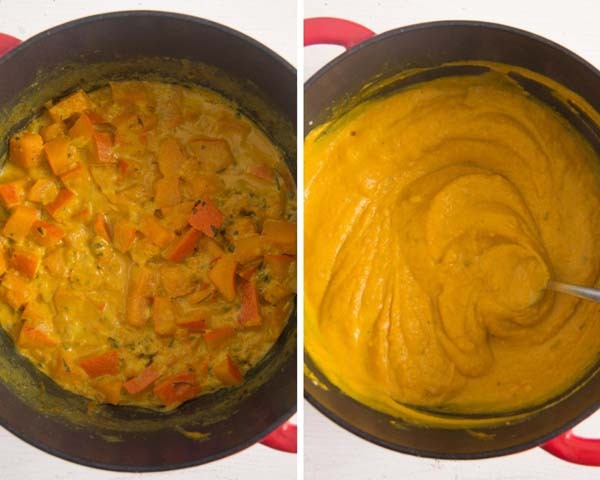 So, I kind of leave it out nowadays and replace it with a bit of turmeric which helps intensify the wonderful bright color of the pumpkin sauce. I use evaporated milk with 4% or 7,5 % fat content instead of cream. The sauce is perfect just like that, so I don’t see the point in using the double cream, which has a much higher fat content. I use some freshly squeezed orange juice for the sauce. It is an idea I got years ago when still cooking baby food for my kids. The recipes I used recommended adding a little fresh orange juice to their purees to enhance the absorption of iron in their bodies. I liked that touch of orange so much (of course I have always tasted their purees), that I got into the habit of adding some orange juice to sauces whenever I happen to have oranges in the house. 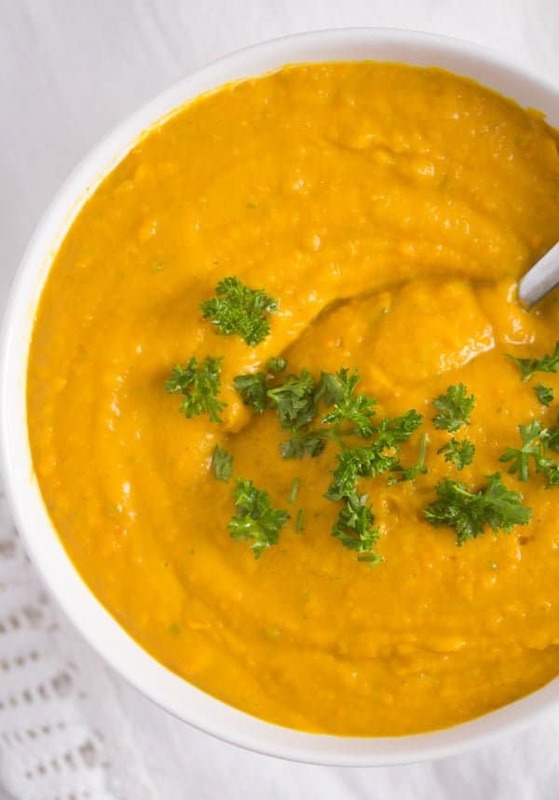 If you don’t happen to have oranges, you could use mandarin or clementine juice instead or leave the juice completely out of this pumpkin sauce recipe. The orange juice gives the sauce a delicious little fruity and fresh touch, but you will still like it without it. Wash the pumpkin. If using Hokkaido pumpkin you will not have to peel it. If you use butternut squash, do peel that. Remove the seeds. Weigh the 500/ 1.1 lbs you will need for the pumpkin pasta sauce. Cube the pumpkin into small cubes. 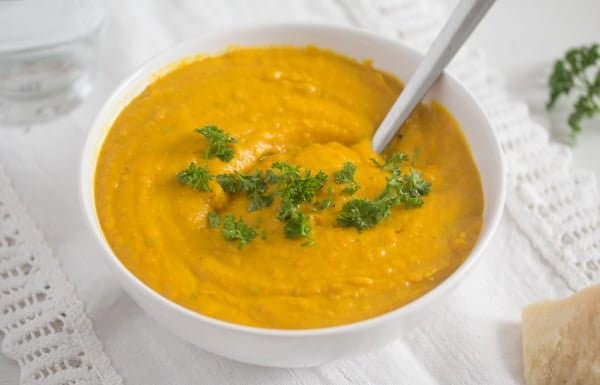 Use the rest of the pumpkin or squash for making other dishes, for instance pumpkin soup, pumpkin lasagna or pumpkin fritters. Chop the onion, garlic and parsley. Cook the onion, garlic, pumpkin in the butter and oil mixture until slightly softened and having a glazed look. Add the turmeric and stir well for about 30 seconds. Add the vegetable stock, evaporated milk and half of the parsley. Cook everything uncovered until the pumpkin is soft and the sauce has thickened. In the meantime you can start cooking the pasta. Puree the sauce with a hand-held blender or in the food processor. Add the orange juice, adjust the taste with salt and pepper and stir well. If the sauce is too thick add 2 or 3 tablespoons evaporated milk to thin the sauce just a little. If you don’t have anymore evaporated milk, regular milk will be fine. Stir in the Parmesan and the remaining chopped parsley and serve immediately with gnocchi, spaghetti or other kind of pasta. The sauce (without the pasta) can be easily reheated. While reheating add a bit more milk and stir very often. Wash the Hokkaido pumpkin, you don't have to peel it. If using butternut squash, you will have to peel that. Remove the seeds and cut the flesh into small cubes. Finely chop the onion and the garlic cloves. Chop the parsley as well. Heat the butter and the olive oil in a larger thick bottomed pot or a deeper pan. Add the onion, garlic and pumpkin cubes, stir well and cook until the onions are translucent and the pumpkin glazed. Add the turmeric and stir well for about 30 seconds. Add half of the parsley and stir. Slowly pour in the stock and the condensed milk and cook on high heat and uncovered until the sauce thickens. Blend the sauce. Add the orange juice and salt and pepper to taste. If the sauce is too thick, add 2 or 3 tablespoons of evaporated milk or regular milk. Stir in the rest of the parsley and the grated Parmesan. 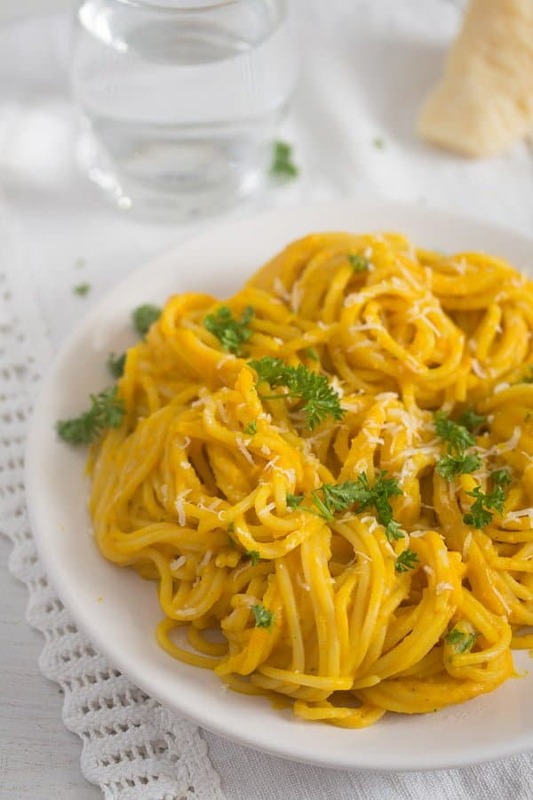 Serve the pumpkin sauce with pasta or gnocchi and more grated Parmesan on top. Note 1: Made from an organic vegetable stock cube is perfectly OK in this case. Note 2: If you don't have anymore evaporated milk, regular milk will be fine. The nutrition information also includes the pasta (not the gnocchi). This sounds so good! I love that little pinch of saffron. I bet it would be good on all kinds of things! I am too a fan of pumpkins. Can’t get enough of them…This sauce looks great and would be great to serve with some spaghetti for the lunch. oh yum! yes, I’m always happy too when pumpkin season rolls around…this sounds delicious! I love pumpkin season and this looks absolutely delicious! I haven’t seen Hokkaido squash in my market – I’ll have to try that. Really love the hint of orange to pumpkin recipes, it adds such a nice, subtle fragrance.